Are you following me through the newsletter labyrinth? (See “How to Improve Your Newsletter” Parts One and Two.) I tell you, it’s been fun learning something I should’ve already known how to do. As I’ve said before, everyone tells us we ought to have a newsletter, but few tell us how to design it effectively. 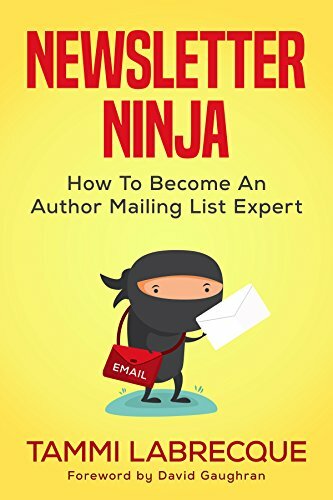 Hence the reason I’ve been touting Newsletter Ninja, by Tammi Labrecque. Following Tammi’s advice, I purged my existing list of deadweight. Then, because I participated in a Ryan Zee BookSweeps campaign, I designed a welcome letter for non-organic subscribers—“non-organic” meaning they didn’t subscribe through my link on my website. Mailchimp pulled a sneaky-pete and changed the way they do things, right in the middle of my big experiment. When I first got my list of new subscribers from BookSweeps, I uploaded them into a Mailchimp list. Fortunately I also tagged them, because Mailchimp merged them with my regular subscribers. I was able to send the welcome newsletter out to the BookSweeps group using the tag, but when I wanted to send to my established group, I had no way to separate them out—unless I wanted to go through every single one of them and add a tag. (I love it when companies use a one-size-fits-all system for all their customers. Sigh.) So take a lesson from that: Establish your tags! I’ve participated in three Ryan Zee newsletter campaigns (they also have BookBub campaigns, which I’ve also participated in). Thanks to Tammi, this is the first time I’ve had an effective follow-up plan. The first one was good, the second was a fiasco because I didn’t choose wisely (see “Major Goof. Major.”). And then, there’s this one—which I’ll get to in a bit. But I can say this: I’ll do it again. It’s affordable, and the results are terrific. Totally worth the expense (which is tax deductible for business purposes anyway). When you’ve chosen your category wisely, you can expect a wonderful list of readers who are fans of your genre. The percentage of these fans who actually recognize your name (unless you’re a NYT best-selling author) is going to be tiny. The percentage of these fans who were participating only in hopes of winning a freebie is going to be huge. But there is a decent percentage of these who don’t mind giving new or lesser-known authors a look-see. That’s priceless, and that’s why Tammi’s Newsletter Ninja is such a vital tool. This campaign was for Christian contemporary romances, which means that I chose the right one for Give the Lady a Ride. Readers who signed up for this are fans of inspy romance, so my product was aimed toward the right audience. By the time it was over, I got 416 new names for my newsletter. Out of the 416 new names, only 176 opened the newsletter. Five names bounced and 14 immediately unsubscribed. That’s great. That means there are 19 folks I don’t have to purge out. I still have 221 readers I could possibly appeal to in the second follow-up letter, but I don’t expect to. They probably sent the newsletter straight to spam. So, I’ll have another purge on my hands. But that’s great, because I’m not looking just to crank up my numbers. I’m looking to turn these fans-of-the-genre to fans-of-Linda. Compare the number delivered to the number of readers who opened the newsletter to the number of times the letter was opened. Out of 411 successful deliveries, 176 opened, but they opened the letter 245 times. I call that encouraging. Did you see the click rate—10.2%? I’m not complaining about that, considering how many readers actually opened the letter. The click-per-unique-open rate jumps to 23.9%. Not complaining at all, especially because I purposely didn’t put that many links in the body of the letter . . . I followed Tammi’s advice in my newsletter and didn’t treat it like a sales brochure. The intro letter (see Coffee with Linda) has a functioning table of contents and short write-ups about my writing history, a bit of personal info, and a bit of what they can expect from my newsletters. All of this, and more, is in Tammi’s book. In the email’s subject line, I identified the readers and how they met me: Welcome BookSweeps Subscribers! shows up in their inbox along with my byline. They knew exactly what they were dealing with before they opened the email. That also gave them the option not to open, which, as I said, is fine. The links with the most clicks were to the floor plans of the house my husband and I hope to build when we move to the farm and to Give the Lady a Ride. I only made one sell, but I didn’t really expect to make any. That wasn’t the purpose of the letter. My book links did not appear in the body of the letter, but down at the bottom, just above my social media links. This is a getting-to-know-you letter, an invitation for them to interact with an author on a more personal basis. I did not have a call-to-action other than to ask if the readers would like the ACFW New Release list which I send out once a month. Not much of a CTA, which is my failing. Although Tammi recommends one, I still haven’t grasped the concept. Should be simple: ask the readers to do something. But what kind of “something” would entice reader action? I don’t know yet. So, how am I measuring success? By the number of opens? By the number of clicks? By the number of people who actually wrote back to tell me personal stories of their late-in-life moves from one home to another. The feedback was super encouraging. Of course, some wrote only to tell me their preference for receiving the ACFW list, but they wrote! The others had some fun stories and great advice to share. As for those who didn’t respond to this newsletter, they’ll have a few more chances. I have a second follow-up to this one scheduled for Friday, then they’ll get the ACFW list (hey–they didn’t say they didn’t want it!) around the first of the month. I’ll keep an eye on those who did respond and add them to my list of regular subscribers. These are the ones who hear of sales and specials and the more personal things going on with me. Of course, “personal” is relative, but things that I don’t otherwise make public. I’m anxious to see how the second letter is received. I’ll let you know. 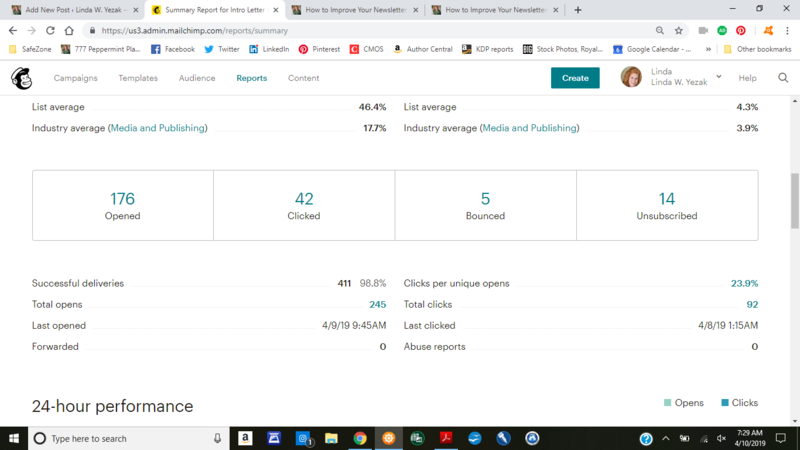 This entry was posted in Promotion/Publicity/Marketing, The Business and tagged BookSweeps, Coffee with Linda, MailChimp, newsletter, Newsletter Ninja, Ryan Zee, Tammi Labrecque. Bookmark the permalink. Awesome, Linda!! So excited for you and us, your friends and readers.